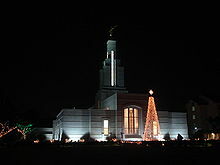 The Accra Ghana Temple is the 117th operating temple of The Church of Jesus Christ of Latter-day Saints (LDS Church). The building of the Accra Ghana Temple was announced on February 16, 1998. Years before the temple was announced, LDS Church president Gordon B. Hinckley had promised members in the area they would someday have a temple close by. When the temple was announced Hinckley also told those in attendance that the church had been trying to find a place to build a temple in Ghana for five years. The temple in Accra is the second of three temples built in Africa. The first Mormon missionaries came to Ghana in 1978. Many of the people present at the announcement of the temple had been some of the first converts in Ghana. A site dedication and groundbreaking ceremony was held on November 16, 2001. Russell M. Nelson, a member of the Quorum of the Twelve Apostles, led the ceremony. The vice president of Ghana, Aliu Mahama, as well as other officials, participated in the groundbreaking ceremony and a radio station and Ghana Television covered the event. The temple sits on 6 acres (24,000 m2) on the main avenue that runs through the center of Accra. The exterior of the temple is made of Namibia Pearl Granite. The temple was open to the public from December 3rd through 20th, 2003. During the tour people were able to see the craftsmanship utilized on the interior of the temple. All of the materials used in the building of the temple were from the area. Moldings in the temple were made of the native makore wood, skilled men in the area handcrafted the furniture and the art-glass windows reflect the culture. The vice president of Ghana as well as many other officials took tours through the temple. There is a stake center on the grounds of the temple. While all members of the church with a valid temple recommend are able to visit the temple, it primarily serves members in Benin, Ghana, the Ivory Coast, Liberia, Sierra Leone, and Togo. ^ "LDS Temple is dedicated in Ghana". January 12, 2004. Retrieved October 30, 2018. ^ Fidel, Steve (February 21, 1998). "A temple to be built in Ghana". The Church News. Retrieved October 30, 2018. ^ Fletcher-Stack, Peggy (2014). "Why Mormonism, U.S.-born faiths are growing in Ghana". Salt Lake Tribune. Retrieved October 29, 2018. ^ "Ground broken for first temple in West Africa". The Church News. November 23, 2001. Retrieved October 30, 2018. ^ a b c "Accra Ghana Temple District". Retrieved October 29, 2018.